The menu may be on the table, displayed on walls, or both. Picture menus are common in larger izakaya. Food and drink are ordered throughout the course of the session as desired. They are brought to the table, and the bill is added up at the end of the session. Unlike other Japanese styles of eating, food items are usually shared by everyone at the table, similar to Spanish tapas. 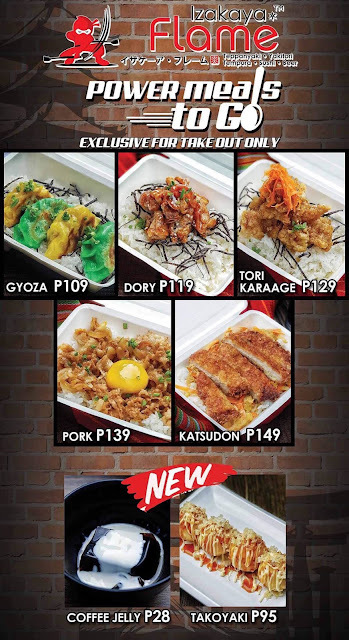 In the Philippines izakayas have evolved and have been adopted to resemble a small restaurant offering Japanese fares. I’ve been to several Filipinized izakayas and ast weekend I found myself in one yet again after being invited by a foodie friend. 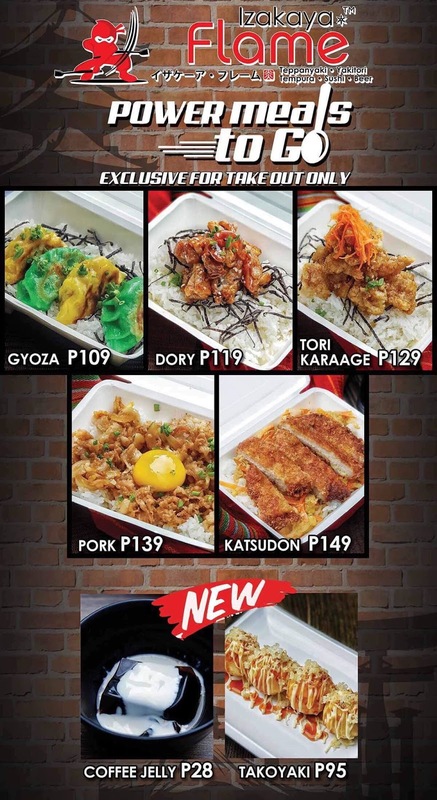 The place is called Izakaya Flame which located at the fourth floor of Uptown Mall in Bonifacio Global City. 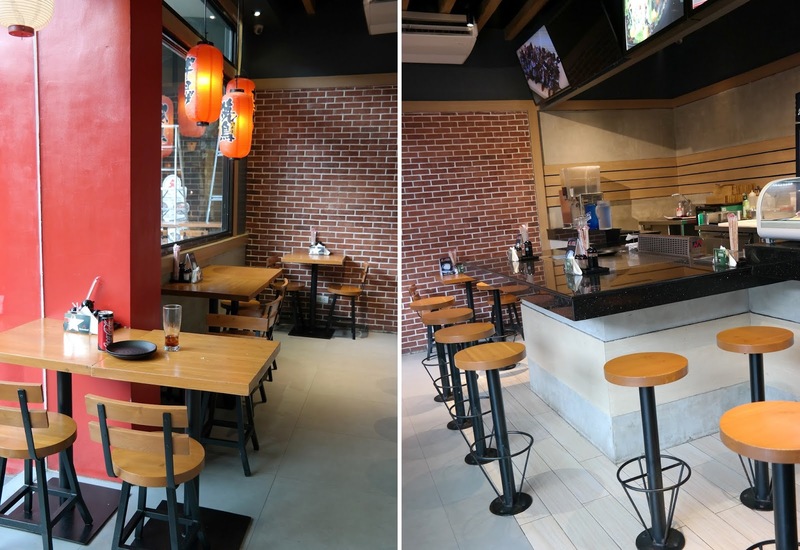 Izakaya Flame is a fast casual teppanyaki resto that showcases a variety of Japanese food including teppanyaki, yakitori, sushi, tempura, ramen, takoyaki, donburi, and maki. Just like a traditional izakaya their place is small with a few seating areas. But they have two teppanyaki grill areas where you can watch as your food is being cooked by their skilled chefs and cooks. For this visit, they let us try their new offering: the Power Meals To-Go. 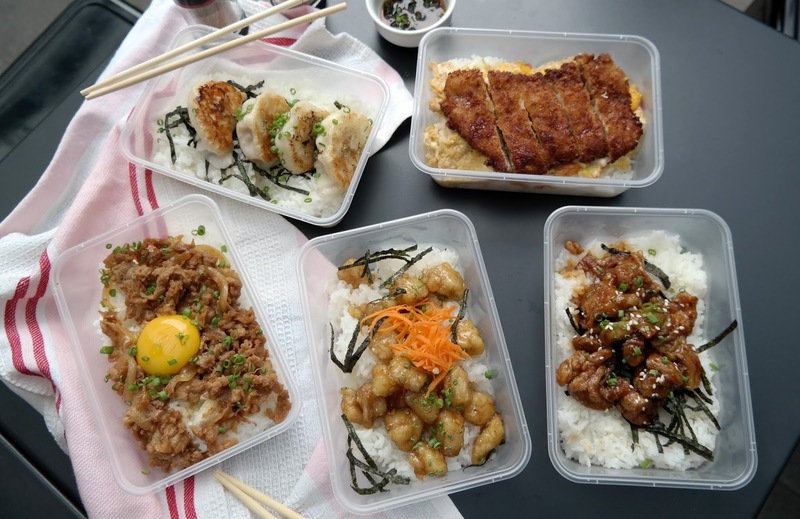 These Japanese favorites will help you have a hassle-free packed lunch for work or just about anywhere you want to bring it to. None of them goes beyond PHP 150! If that’s not a value, well I don’t what is! But these meals are exclusive for take-out orders only. Deliveries can be made depending on the area as well. Gyoza Power Meal To-Go - Japanese pork dumplings w/ gyoza sauce. Dory Power Meal To-Go - Japanese style fish marinated on sake mixture, coated then deep fried. Tori Karaage Power Meal To-Go - Japanese style chicken marinated on sake mixturen, coated then deep fried. Pork Gyudon Power Meal To-Go - sauteed pork on donburi sauce topped with egg yolk. Katsudon Power Meal To-Go - breaded pork cutlet braised on donburi sauce. Spicy Beef Roll - sautéed beef, tabasco sauce, Kani sticks and pickled cucumber. I like that it's not so spicy and each is packed with flavor. Dulong Maki - maki topped and filled with dulong. maki topped with fried kani. Dulong is translated as Silver Fish in English probably due to its color. It's the tiniest fish that can be found in the Philippines and usually cooked as a fritter. I love the salty flavor of this maki. We got first dibs on this maki and it will soon be included in the regular menu. Beef Teppanyaki - sauteed beef tenderloin with garlic & teppanyaki sauce. One of the cooks cooked this dish in front of us which is quite cool if you ask me. The beef was super tender, super easy to chew and of course super tasty. Takoyaki - ball-shaped Japanese snack made of a wheat flour-based batter and cooked in a special molded pan. It is typically filled with minced or diced octopus, tempura scraps and green onions. Their takoyaki is super soft on the inside and slightly crunchy on the outside. I love how their takoyaki sauce tasted. Ice Cream Tempura - battered ice cream with sweetened mirin and ripe mango. I enjoyed taking photos of this dessert as well as eating it. I loved that they chose to use mango together with the vanilla ice cream. If you’re one of those who can’t prep their own packed lunch or when you don’t want to think about what you’re going to eat at home after a work day and most especially if you happen to work near the area, I highly suggest that you try Izakaya Flame’s Power Meals To-Go. There’s one for each day of the work week and they’ll surely not burn your pocket.